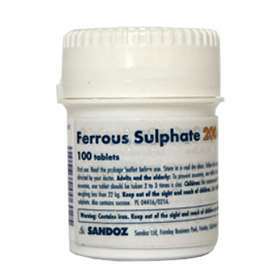 Ferrous Sulphate 100 Tablets 200mg are used for the prevention and treatment of Iron-Deficiency Anaemia. Ferrous Sulphate belongs to a group of medicines called iron supplements that work by replacing body iron, a mineral the body requires to produce red blood cells. When the body does not get enough iron, it will not produce the number of normal red blood cells needed to maintain a good level of health. For the prevention and treatment of iron-deficiency anaemia. Contains 200mg dried ferrous sulphate BP equivalent to 65mg of ferrous iron. You have fewer red blood cells than normal. Or, You have less haemoglobin than normal in each red blood cell. In both cases, a reduced level of oxygen is carried around the bloodstream. In the UK alone the most common cause of Anaemia is due to a lack of iron. The body requires Iron to make Haemoglobin. Anaemia caused by a lack of iron is called Iron-Deficiency Anaemia. Common symptoms of Iron-Deficiency Anaemia are tiredness, lethargy, feeling faint and becoming breathless easily. These are all caused by reduced amounts of oxygen in the body. Less common symptoms include headaches, palpitations, ringing in the ears, sore mouth and altered taste. Ferrous sulphate BP (Active Substance), Spray Dried Liquid Glucose, Stearic Acid, Magnesium Stearate, Microcrystalline Cellulose, Lactose Granules, Maize Starch, Pregelatinised Maize Starch, Purified Talc, Acacia, Gelatin, Sucrose, Titanium Dioxide, Beeswax, Yellow Carnauba Wax, Polysorbate, Sorbic Acid, Propylene Glycol. Each tablet contains 200mg dried ferrous sulphate BP equivalent to 65mg ferrous iron. Treatment: 2-3 tablets a day in divided doses. Prevention: 1 tablet a day. Children weighing over 22kg: one tablet a day. Children weighing over 44kg: one tablet twice a day. Children weighing over 66kg: one tablet three times a day. Do not exceed the daily recommended intake. Although iron preparations are best absorbed on an empty stomach, they may be taken after food to reduce gastrointestinal side effects. Do not use on children under 6 years or weighing less than 22kg. are allergic (hypersensitive) to dried ferrous sulphate or any of the other ingredients in Ferrous Sulphate tablets. are receiving repeated blood transfusions. have a disorder in which there is excessive absorption and storage of iron such as haemochromatosis. an iron storage or absorption disease.